Tip: Rules, Rules, Rules. Different rules apply for those receiving Social Security disability benefits vs. Supplemental Security income payments. Different rules also apply for those working outside the U.S.
And that possibility raises an interesting question: How will working affect Social Security benefits? To answer that question requires an understanding of three key concepts: full-retirement age, the earnings test, and taxable benefits. Most workers don’t face an “official” retirement date, according to the Social Security Administration. The Social Security program allows workers to start receiving benefits as soon as they reach age 62—or to put off receiving benefits until age 70. Starting Social Security benefits before reaching full retirement age brings into play the earnings test. In this case, the worker’s annual Social Security benefit would have been reduced by $6,547 because he or she is continuing to work. Fast Fact: Earnings Test. The Senior Citizens’ Freedom to Work Act of 2000 eliminated the annual earnings test after the month a person attains his or her full retirement age. Once you reach full retirement age, Social Security benefits will not be reduced no matter how much you earn. However, Social Security benefits are taxable. For example, say you file a joint return and you and your spouse are past the full retirement age. In the joint return, you report a combined income of between $32,000 and $44,000. You may have to pay income tax on as much as 50% of your benefits. If your combined income is more than $44,000, as much as 85% of your benefits may be subject to income taxes. There are many factors to consider when evaluating Social Security benefits. Understanding how working may affect total benefits can help you put together a program that allows you to make the most of all your retirement income sources—including Social Security. What’s Your Full Retirement Age? Those born in 1942 or before were already eligible for full Social Security benefits at age 65. 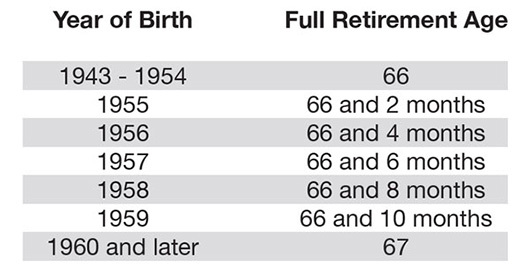 For those born between 1943 and 1960, full retirement age increases incrementally until it reaches 67. Regardless of how you approach retirement, there are some things about it that might surprise you. Securities offered through Kestra Investment Services, LLC (Kestra IS), member FINRA/SIPC. Investment advisory services offered through Kestra Advisory Services, LLC (Kestra AS), an affiliate of Kestra IS. Kestra IS and Kestra AS are not affiliated with U.S. Financial Services, LLC. Neither Kestra IS or its affiliates provide legal or tax advice and is not a Certified Public Accounting firm. This site is published for residents of the United States only. Registered Representatives of Kestra Investment Services, LLC and Investment Advisor Representatives of Kestra Advisory Services, LLC may only conduct business with residents of the states and jurisdictions in which they are properly registered. Therefore, a response to a request for information may be delayed. Not all of the products and services referenced on this site are available in every state and through every representative or advisor listed. For additional information, please contact our Compliance Department at 512-697-6000.